boolean hasNext(): this method returns true if this Iterator has more element to iterate. remove(): method remove the last element return by the iterator this method only calls once per call to next(). Object next() : Returns the next element in the iteration. Make a loop to decide the next element availability by calling hasNext() method. Get each element from the collection by using next() method. Here is an example demonstrating Iterator. It uses an ArrayList object, You can apply to any type of collection. Iterator is the best choice if you have to iterate the objects from a Collection. But, Iterator having some limitations. If you need to update the collection object being iterated, normally you are not allowed to because of the way the iterator stores its position. And it will throw ConcurrentModificationException. It does not allow to traverse to bi directions. Internally the for-each loop creates an Iterator to iterate through the collection. 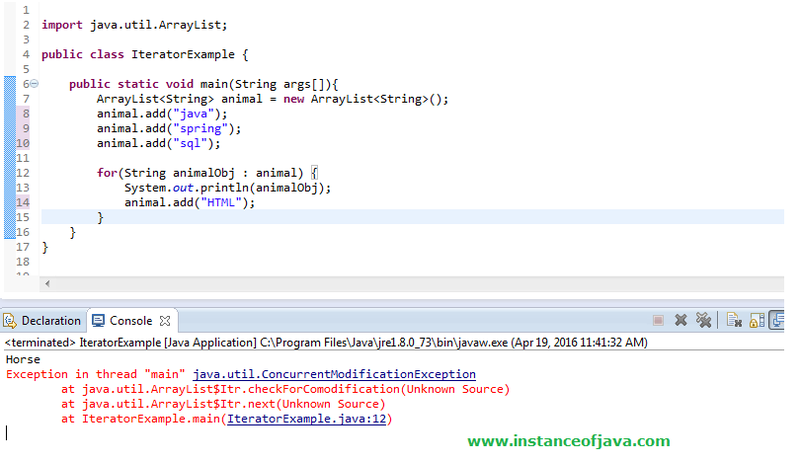 Consider the following code snippet, to understand the difference between how to use Iterator and for-each loop. Same code has been rewritten using enhanced for-loops which looks more readable. But enhanced for-loops can’t be used automatically in Collection objects that we implement. Then what do we do? This is where Iterable interface comes in to picture. Only, if our Collection implemented Iterable interface, we can iterate using enhanced for-loops. The advantage of implementing Iterable interface So, we should implement Java Iterable interface in order to make our code more elegant. Here I am going to write a best Practice to develop a custom iterator. Following is the Syntax. Here, we created a BookShop class which contains books. This class able to use for-each loop only if it implements Iterable interface.Here, we have to provide the implementation for iterator method. we define my BookShopIterator as inner class. Inner classes will provide more security, So that your class is able to access with in the Outer class and this will achieve data encapsulation. The best reusable option is to implement the interface Iterable and override the method iterator().The main advantage of Iterable is, when you implement Iterable then those object gets support for for:each loop syntax. Execute above program and check output. Practice makes perfect.